2) On both Snapdragon 600 and Exynos 5410 SGS4 platforms, Samsung was detecting the presence of certain benchmarks and automatically driving CPU voltage/frequency to their highest state right away. Also on Snapdragon platforms, all cores are plugged in immediately upon benchmark detect. The first point applied exclusively to the Exynos 5410 equipped version of the Galaxy S 4. We did a lot of digging to confirm that max GPU frequency (450MHz) was never exceeded on the Snapdragon 600 version. The second point however applied to many, many more platforms. Looking at the table above you’ll also notice weird inconsistencies about the devices/OEMs that choose to implement the cheat/hack/festivities. None of the Nexus do, which is understandable since the optimization isn't a part of AOSP. This also helps explain why the Nexus 4 performed so slowly when we reviewed it - this mess was going on back then and Google didn't partake. The GPe versions aren't clean either, which makes sense given that they run the OEM's software with stock Android on top. 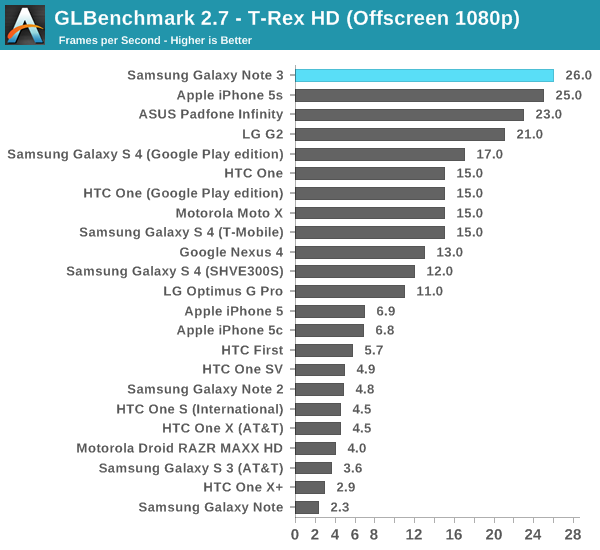 LG’s G2 also includes some optimizations, just for a different set of benchmarks. It's interesting that LG's optimization list isn't as extensive as Samsung's - time to invest in more optimization engineers? LG originally indicated to us that its software needed some performance tuning, which helps explain away some of the G2 vs Note 3 performance gap we saw in our review. The Exynos 5420's behavior is interesting here. Instead of switching over to the A15 cluster exclusively it seems to alternate between running max clocks on the A7 cluster and the A15 cluster. Note that I’d also be careful about those living in glass houses throwing stones here. Even the CloverTrail+ based Galaxy Tab 3 10.1 does it. I know internally Intel is quite opposed to the practice (as I’m assuming Qualcomm is as well), making this an OEM level decision and not something advocated by the chip makers (although none of them publicly chastise partners for engaging in the activity, more on this in a moment). The other funny thing is the list of optimized benchmarks changes over time. 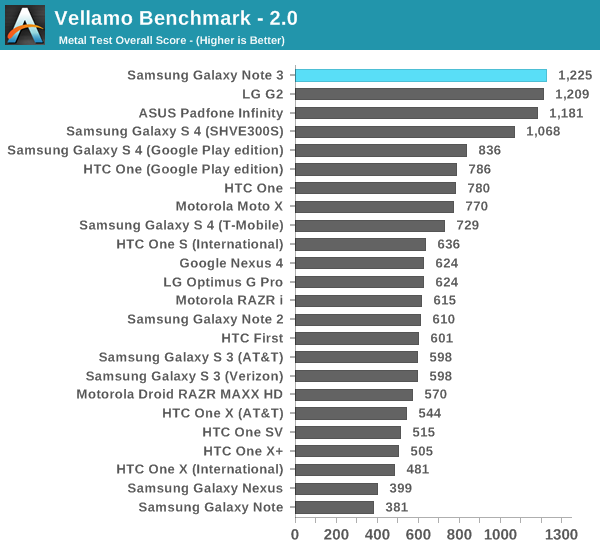 On the Galaxy S 4 (including the latest updates to the AT&T model), 3DMark and Geekbench 3 aren’t targets while on the Galaxy Note 3 both apps are. Due to the nature of the optimization, the benchmark whitelist has to be maintained (now you need your network operator to deliver updates quickly both for features and benchmark optimizations!). There's a 4.4% increase in performance from the CPU optimization. Some of that gap is actually due to differences in compiler optimizations (V1 is tuned by the OEMs for performance, V2 is tuned for compatibility as it's still in beta). As expected, we're not talking about any tremendous gains here (at least as far as our test suite is concerned) because Samsung isn't actually offering a higher CPU frequency to the benchmark. All that's happening here is the equivalent of a higher P-state vs. letting the benchmark ramp to that voltage/frequency pair on its own. We've already started work on making sure that all future versions of benchmarks we get will come with unique package names. We're looking at is a single loop of the core AndEBench MP test. The blue line indicates what happens naturally, while the red line shows what happens with the CPU governor optimization enabled. Note the more gradual frequency ramp up/down. In the case of this test, all you're getting is the added performance during that slow ramp time. For benchmarks that repeat many tiny loops, these differences could definitely add up. In situations where everyone is shipping the same exact hardware, sometimes that extra few percent is enough to give the folks in marketing a win, which is why any of this happens in the first place. 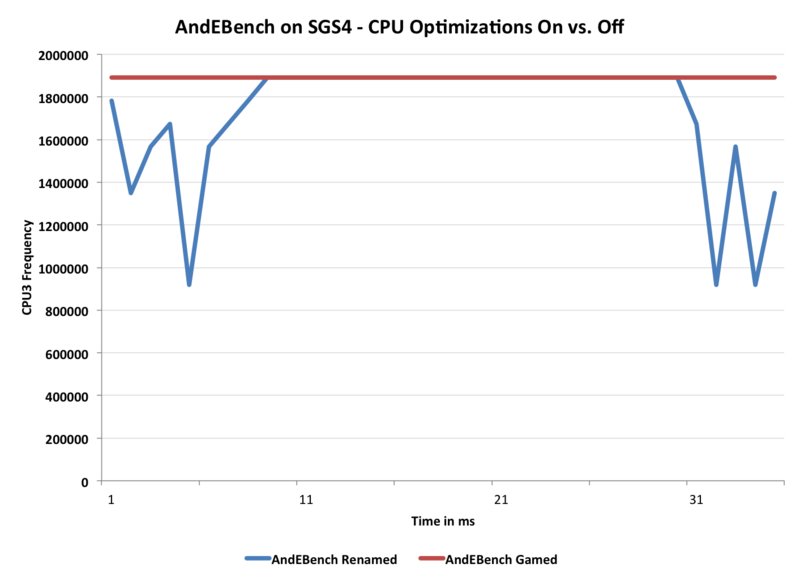 Even when the Snapdragon 600 based SGS4 recognizes AndEBench it doesn't seem to get in the way of thermal throttling. A few runs of the test and I saw clock speeds drop down to under 1.7GHz for a relatively long period of time before ramping back up. I should note that the power/thermal profiles do look different when you let the governor work its magic vs. overriding things, which obviously also contributes to any performance deltas. Any wins the Galaxy Note 3 achieves in our browser tests are independent of the CPU frequency cheat/optimization discussed above. It’s also important to point out that this is why we treat our suite as a moving target. I introduced Kraken into the suite a little while ago because I was worried that SunSpider was becoming too much of a browser optimization target. The only realistic solution is to continue to evolve the suite ahead of those optimizing for it. The more attention you draw to certain benchmarks, the more likely they are to be gamed. We constantly play this game of cat and mouse on the PC side, it’s just more frustrating in mobile since there aren’t many good benchmarks to begin with. Note that pretty much every CPU test that’s been gamed at this point isn’t a good CPU test to begin with. Don’t forget that we’re lucky to be able to so quickly catch these things. After our piece in July I figured one of two things would happen: 1) the optimizations would stop, or 2) they would become more difficult to figure out. At least in the near term, it seems to be the latter. The framework for controlling all of this has changed a bit, and I suspect it’ll grow even more obfuscated in the future. There’s no single solution here, but rather a multi-faceted approach to make sure we're ahead of the curve. We need to continue to rev our test suite to stay ahead of any aggressive OEM optimizations, we need to petition the OEMs to stop this madness, we need to work with the benchmark vendors to detect and disable optimizations as they happen and avoid benchmarks that are easily gamed. Honestly this is the same list of things we do on the PC side, so we've been doing it in mobile as well. Also keep in mind that both LG and Samsung will define their own governor behaviors on top of all of this. Even using the same silicon you can choose different operating temperatures you’re comfortable with. Of course this is another variable to game (e.g. increasing thermal headroom when you detect a benchmark), but as far as I can tell even in these benchmark modes thermal throttling does happen. The onscreen differences make sense to me, it's the off screen results that are a bit puzzling. I'm worried about what's going on with the off-screen rendering buffer. That seems to be too little of a performance increase if the optimization was dropping frames (if you're going to do that, might as well go for the gold), but as to what is actually going on I'm not entirely sure. We'll keep digging on this one. The CPU optimization alone should net something around the 3% gain we see in the on screen test. 3DMark is a bigger concern. 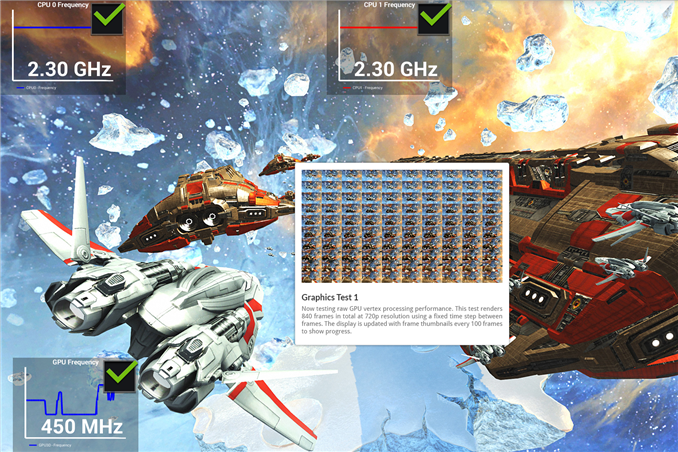 As we discovered in our Moto X review, 3DMark is a much more balanced CPU/GPU test. Driving CPU frequencies higher can and will impact the overall scores here. 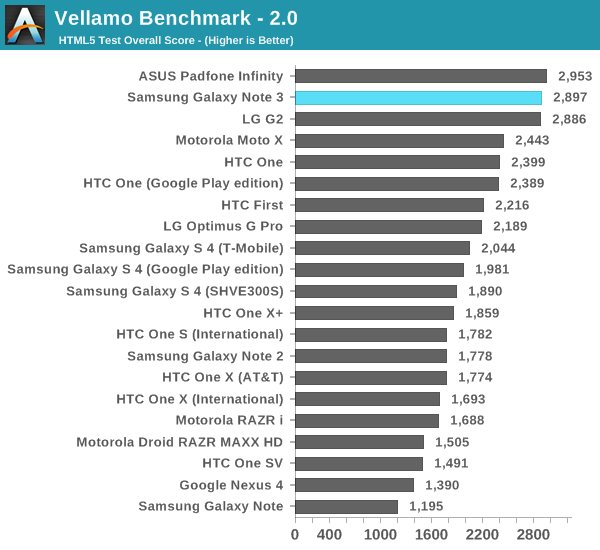 ASUS thankfully doesn’t do any of this mess with their Padfone Infinity in the GPU tests. 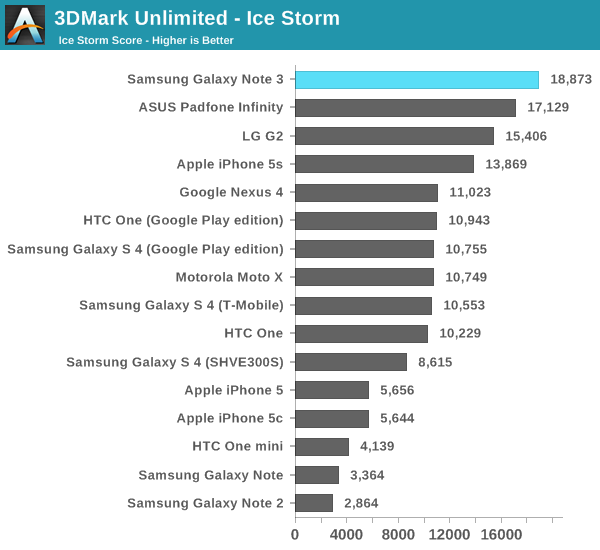 Note that there are still driver and video memory differences between the Padfone Infinity and the Galaxy Note 3, but we’re seeing roughly a 10% performance advantage in the overall 3DMark Extreme score (the Padfone also has a slightly lower clocked CPU - 2.2GHz vs. 2.3GHz). It's tough to say how much of this is due to the CPU optimization vs. how much is up to driver and video memory differences (we're working on a renamed version of 3DMark to quantify this exactly). "With the exception of setting mandatory parameters specific to systems with multiple GPUs, such as AMD CrossFire or NVIDIA SLI, drivers may not detect the launch of the benchmark executable and alter, replace or override any parameters or parts of the test based on the detection. Period." If I'm reading it correctly, both HTC and Samsung are violating this rule. What recourse Futuremark has against the companies is up in the air, but here we at least have a public example of a benchmark vendor not being ok with what's going on. 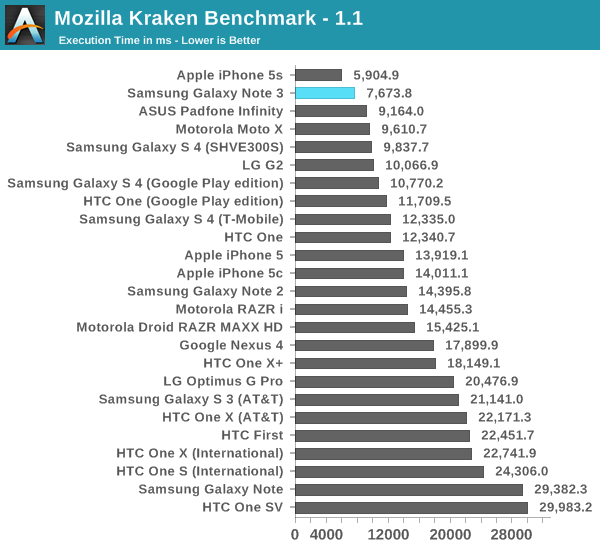 Note that GFXBench 2.7, where we don't see anyone run the CPU optimization, shows a 13% advantage for the Note 3 vs. Padfone Infinity. Just like the Exynos 5410 optimization there simply isn't a lot to be gained by doing this, making the fact that the practice is so widespread even more frustrating. As we mentioned back in July, all of this is wrong and really isn't worth the minimal effort the OEMs put into even playing these games. If I ran the software group at any of these companies running the cost/benefit analysis on chasing these optimizations vs. negativity in the press it’d be an easy decision (not to mention the whole morality argument). It's also worth pointing out that nearly almost all Android OEMs are complicit in creating this mess. We singled out Samsung for the initial investigation as they were doing something unique on the GPU front that didn't apply to everyone else, but the CPU story (as we mentioned back in July) is a widespread problem. Ultimately the Galaxy Note 3 doesn’t change anything from what we originally reported. The GPU frequency optimizations that existed in the Exynos 5410 SGS4 don’t exist on any of the Snapdragon platforms (all applications are given equal access to the Note 3’s 450MHz max GPU frequency). The CPU frequency optimization that exists on the SGS4, LG G2, HTC One and other Android devices, still exists on the Galaxy Note 3. This is something that we’re going to be tracking and reporting more frequently, but it’s honestly no surprise that Samsung hasn’t changed its policies here. The majority of our tests aren’t impacted by the optimization. Virtually all Android vendors appear to keep their own lists of applications that matter and need optimizing. The lists grow/change over time, and they don’t all overlap. With these types of situations it’s almost impossible to get any one vendor to be the first to stop. The only hope resides in those who don’t partake today, and of course with the rest of the ecosystem. We’ve been working with all of the benchmark vendors to try and stay one step ahead of the optimizations as much as possible. Kishonti is working on some neat stuff internally, and we’ve always had a great relationship with all of the other vendors - many of whom are up in arms about this whole thing and have been working on ways to defeat it long before now. There’s also a tremendous amount of pressure the silicon vendors can put on their partners (although not quite as much as in the PC space, yet), not to mention Google could try to flex its muscle here as well. The best we can do is continue to keep our test suite a moving target, avoid using benchmarks that are very easily gamed and mostly meaningless, continue to work with the OEMs in trying to get them to stop (though tough for the international ones) and work with the benchmark vendors to defeat optimizations as they are discovered. We're presently doing all of these things and we have no plans to stop. Literally all of our benchmarks have either been renamed or are in the process of being renamed to non-public names in order to ensure simple app detects don't do anything going forward. The unfortunate reality is this is all going to get a lot worse before it gets better. We wondered what would happen with the next platform release after our report in July, and the Note 3 told us everything we needed to know (you could argue that it was too soon to incite change, perhaps SGS5 next year is a better test). Going forward I expect all of this to become more heavily occluded from end user inspection. App detects alone are pretty simple, but what I expect to happen next are code/behavior detects and switching behavior based on that. There are thankfully ways of continuing to see and understand what’s going on inside these closed platforms, so I’m not too concerned about the future. "The best we can do is continue to keep our test suite a moving target, avoid using benchmarks that are very easily gamed and mostly meaningless, continue to work with the OEMs in trying to get them to stop (though tough for the international ones) and work with the benchmark vendors to defeat optimizations as they are discovered. " Name and shame just doesn't have enough visibility to make an impact. People see and remember the graphs, while the text where you name and shame doesn't make as much an impact and is soon forgotten. Samsung invented the panel lottery, one round of panels go to reviewers & display models and the next round of production are a crapshoot from four or five different chinese factories.